Posted June 11, 2013 by Sue & filed under MS News. Skills – We need your help! Posted June 11, 2013 by Sue & filed under Fundraising. Please let Sue know what skills you can offer, so we know who to ask for help. Maybe you could approach your Rotary club and ask them to organise an annual event for us, or you could have a cake sale at your home, or maybe your know someone else who belongs to a club who can organise an event for us? Perhaps you have family or friends who could help? Posted June 11, 2013 by Sue & filed under Centre News. Posted May 28, 2013 by Sue & filed under Centre News. Guideposts Trust Independent Living Centre, Carers Oxfordshire and Abingdon Health & Wellbeing Centre Open Day. Many organisations will be attending including The Oxfordshire Community Bladder and Bowel Service. Posted May 14, 2013 by Sue & filed under Fundraising. Which means when you shop online you can help provide the centre with commission paid from many of the retailers registered with the scheme. 1. Click on this link www.spendandraise.com/omstc. Please share the link with as many friends and family as possible, the more they spend the more we raise! Posted May 14, 2013 by Sue & filed under MS News. A research team at the University of Oxford are researching the effects of sharing online patient information. They wish to find the best ways to incorporate people’s experiences into health websites. They would like your help to find out whether the questions are easy to understand and accurately reflect the effects of using health websites. Multiple Sclerosis suffers in Oxfordshire are missing out on life-changing drugs, a new report has found. A survey by the MS Society found that 79 per cent of Oxfordshire MS patients are not getting proper help. We are delighted to tell you about the launch of a new fundraising scheme to support the centre. OMSTC 100 is a lotto with fantastic odds, and once set up it requires no time or effort on your part. Paid up members can buy one or more numbers which are entered into twelve monthly draws. There are no running costs, so a guaranteed 50% of all income is awarded as cash prizes, and all the rest goes straight towards the running of the centre. With numbers costing only £5 each per month, the income from just 100 sales builds a prize fund of £3000 a year, with the same amount going to help fund the centre. With three prizes a month, the odds are extremely good. Signing up is easy please contact Sue for an application form. Posted May 14, 2013 by Sue & filed under Events. 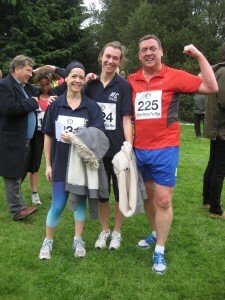 A huge thank you to David Harsant, his daughter Alice and Sarah-Jane’s friend Lucy for running in the Oxford Fun Run. They hope to have raised over £500.00 – well done!!!!!!!! !